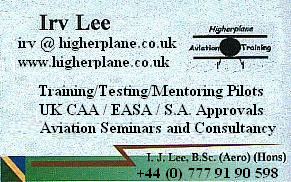 Mentoring the Private Pilot flying in the UK, EASA/NPPL Testing, Renewals & Validations, PPL Masterclasses, Radio Training & Testing, South African Vacation & Licensing advice, Consultancy and much more besides . . . . . This site is the replacement for higherplane.flyer.co.uk, and certain pages may give 'page not found' for a short while. A UK Flight Examiner, a prolific aviation writer with many hundreds of major articles published in UK and South African aviation magazines, a visiting lecturer at a leading UK university, winner of AOPA UK's national Safety Award, part of the UK's General Aviation Safety Council 2006-2017, the pilot who designed and ran FlyOnTrack for 11 years, a site dedicated to reducing unauthorised infringements of UK airspace, an invited member of the Civil Aviation Authority's (CAA) core team dedicated to deliver UK aviation's contribution to a safe and secure 2012 Olympics, and working on projects with both NATS (National Air Traffic Services) and the CAA to communicate their key safety messages to General Aviation pilots and instructors. Confused by the different licence/rating/medical combinations? Advert: EASA licence or not, the pre flying tips are the same, and lots of EASA/National confusions are sorted out with a Pre Preflight Checklist, the ideal safety addition to your flight bag. It also solves a big problem for friends/relatives who never know what to get you as a present. Get them to click on the link or the tag on the left for details and purchase. Orders usually delivered in under 2 working days, often next day if timings work out.